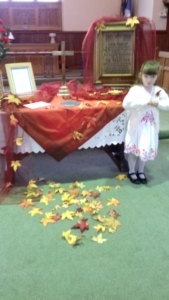 At our Remembrance Service on 11th November we displayed the names of those from our church who had lost their lives during ‘The Great War’. 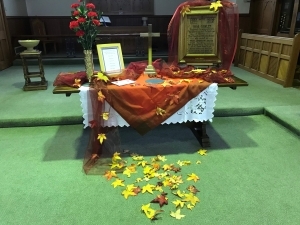 This included those from the former Shipley United Reformed Church and those from Hall Royd Methodist Church. 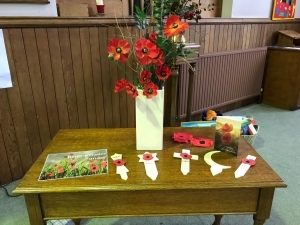 A cascade of Autumn leaves represented falling poppies and our some of our red flowers were displayed in a shell case trench-art vase. 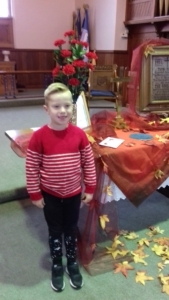 Our service was ably led by Barry Empson and of course a two minute silence was observed.